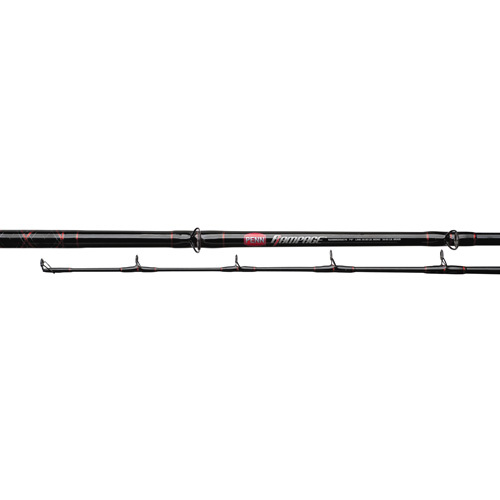 The Rampage rod is designed to be a work horse for charter boats or anglers that need durability in a variety of fishing situations. Constructed with tubular glass blank for extra strength, the Rampage also features a solid glass tip that helps keep the rod tip from breaking even when high sticked. A heavy duty Pac Bay reel seat ensures a secure lock on the reel foot, eliminating flex while under heavy load. Each rod features guides built with heavy duty stainless steel frames and aluminum oxide inserts that are perfect for both mono and braided lines. EVA Torque grips are contoured to fit your hand perfectly and eliminate the rod from twisting while under heavy load.